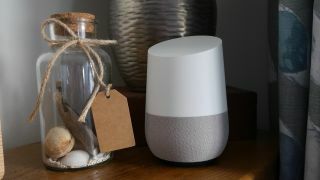 Google might not have shown up with new Home hardware to Google IO 2017, but its latest software update will make the six-month-old Google Home feel like a new machine. On stage today at Google IO, Rishi Chandra, Vice President of Product Management and General Manager of Home Products, iterated four major changes coming to Google Home: proactive assistance, hands-free calling, Bluetooth and visual responses. While some of these changes will have more of an impact than others (you can now make phone calls from Google Home without a landline or a cell phone at no cost! ), all of them will reshape you use the Home going forward. Let’s start off by covering the two biggest announcements first: hands-free calling and Bluetooth. According to Chandra, the way calling is going to work is that you’ll import contacts from your phone and then, when you want to make a phone call, all you’ll need to do is ask. The Home will make the call from either a private phone number or, if you have your Google account tied to your cell phone, using your own number. From the sounds of it, all Home needs is an active internet connection to make the calls – that means you won’t need a landline or even a cell phone to make calls at home. The other bombshell announcement Chandra made is that Home will now be able to use Bluetooth to sync up to other devices – a feature the Home’s competitor, Amazon Echo, has had since it launched and had so far been strangely absent on Google’s smart speaker. In addition to the Bluetooth announcement, Chandra announced that the Home will support the free version of Spotify, SoundCloud and Deezer in addition to the music streaming services it already supported later this summer. The other two announcements – proactive assistance and visual responses – while neat, aren’t going to radically change how you use Home. Visual responses, a new feature on Google Home that allows the speaker to send visual information to either your phone, tablet or TV, definitely feels like a swing at the recently announced Amazon Echo Show. However, while Amazon’s device comes with a built-in speaker to show you events on your calendar or what the weather outside looks like, Google Home transmits data to whichever device you’d like. To demonstrate, Chandra used the Home to ask what he had in his YouTube TV library which was then displayed on the TV. Including YouTube TV, Home now has voice support for dozens of new streaming services including HBO Now, Hulu, Google Play Movies and TV and more. Finally, proactive assistance for Home will check what’s happening in your day in real time to try and bring you information before you need it. Home can warn you that there’s a traffic delay on your way to work, for example, notifying you ahead of time so you can leave earlier, or give you weather warnings – handy if you commute in an area prone to blizzards. How soon can you expect these changes to go live? Google didn’t have an exact release date for the new functionality, but we’ve reached out to Google for more specifics.